Corporate giving can help your organization to become more attractive for your current employees and potential new employees. 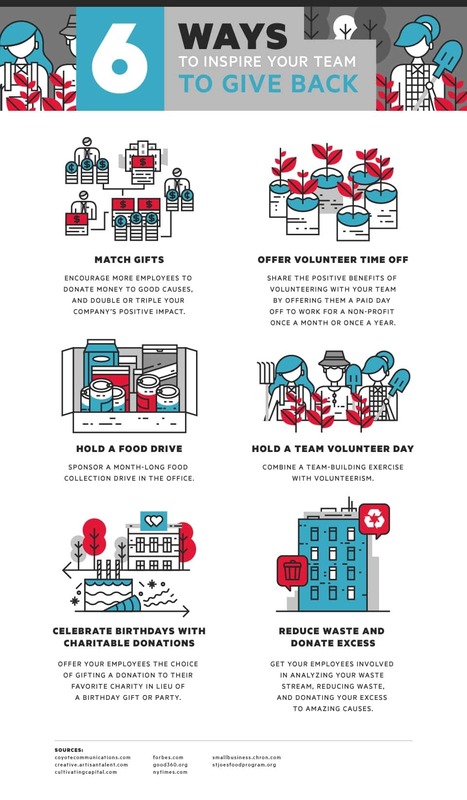 Check out this infographic for ideas on how to encourage your team to give back. Establishing a corporate culture can be a difficult thing. You want your company to do well and to grow a future—to cultivate community leaders, to be an innovator, to create a community of ardent supporters—but a culture is more than just sales of a product or service. A culture is how you think about the world around you, and how you execute on that daily and out into the broader community. One of the ways that you can choose to build on and build out a culture is to decide to give back as a team. Philanthropic efforts that focus on a particular community need—shelter, hunger, education—can be a great way for your business to decide a crucial part of its culture. And studies have shown that employees and potential employees’ value those giving back, efforts, too. What else should you consider as you build giving back into your company culture? This graphic explains it. Want to receive tips on how to become more successful with your Nonprofit, NGO or Social Enterprise? Sign up for the mailing list below to receive insights every now and then. Share your thoughts about corporate giving and giving back as a team in the comment section below. I’m really looking forward to reading your comments.